This image is from awhile back when she still lived in Montana, she now sports white wall tires and Utah plates, but otherwise she looks the same. She runs a whole lot better though. The days of blue smoke from the exhaust are over. Today I gave her two little tweaks; a new gasket for the primer on the carburetor, and her third fuel filter since splicing one into the fuel line back in 2009. The issue with the gasket was fuel leakage, which pools gasoline right next to the electric starter which sits atop the engine. The 64.5 is the only model with this dubious design. She was being looked over by the national judge for Mustangs of this vintage that are still with their original owners / in the family and that are still in their original condition / occasional driver. I was surprised that there was a show category that fit us, and that the judge lived in Salt Lake- he dropped by the house to look her over. He spotted the little drip from the gasket and told me not to start it up again until I replaced it. His concourse 64.5 pony car (like supermodel concourse, i.e. restored to factory show room and never driven again living as a trailer queen pulled in a fully enclosed trailer from show to show) caught fire for a minute in his garage from the same little leak. So now she won’t catch on fire, at least not from that. 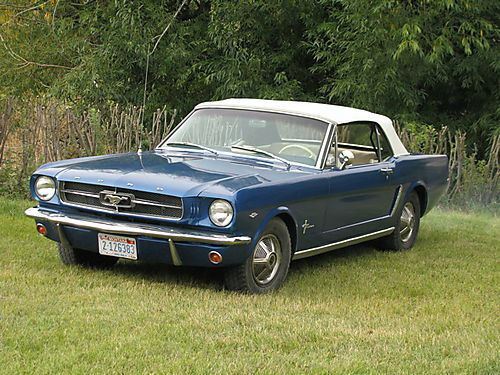 The judge has personally restored over 250 mustangs, and he was a little flushed and car-crazy for her. She tends to have that effect on people.